I borrowed elements from a few different recipes for this meal prep. The chicken marinade I used is the same marinade from the chicken thighs in my Greek Chicken Pasta Salad. It’s super garlicky and has a wonderful tangy lemon finish. I’ve included the recipe for the marinade itself later in this post to make things a little easier, so just scroll down past the meal prep section to find the recipe and step by step photos. I also added some blistered tomatoes to the meal to add color and a little more vibrant flavor. The blistered tomato technique was borrowed from this Parsley Pesto Pasta with Blistered Tomatoes recipe. 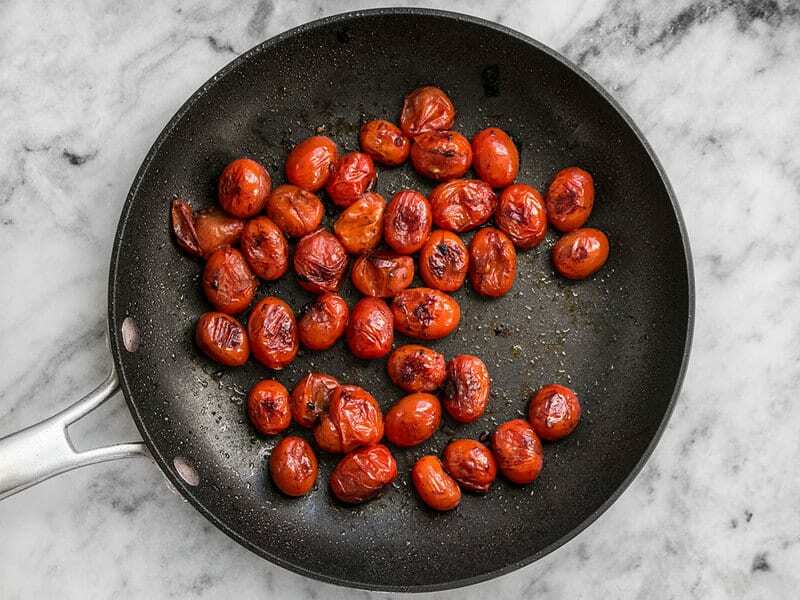 You basically just cook the tomatoes in a skillet until the skin blisters and bursts and some of the juice spills out and caramelizes in the skillet. I cooked these tomatoes in the same skillet as the garlic marinated chicken, so they also picked up some of that flavor. They’re SO GOOD. 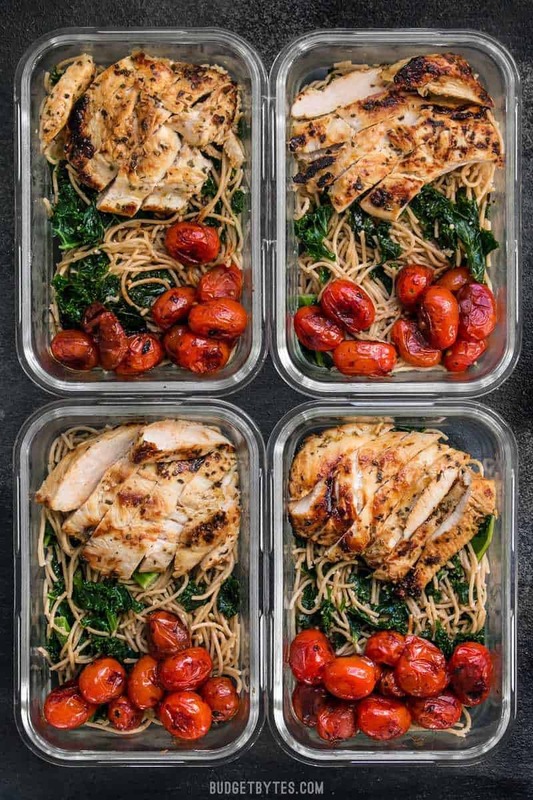 For this meal prep I prepared the marinade for the chicken first, then prepared the Garlic Parmesan Kale Pasta while the chicken was marinating. Once the pasta was finished, I quickly cooked the chicken and tomatoes, then assembled everything. So easy! This Garlic Marinated Chicken is bursting with flavor and works just as well on the grill as it does in a skillet on the stove top! Add the olive oil, lemon juice, garlic, oregano, salt, and pepper to a large zip top bag, or a large shallow dish. Close the bag and massage to combine the ingredients, or stir the ingredients in the dish until combined. 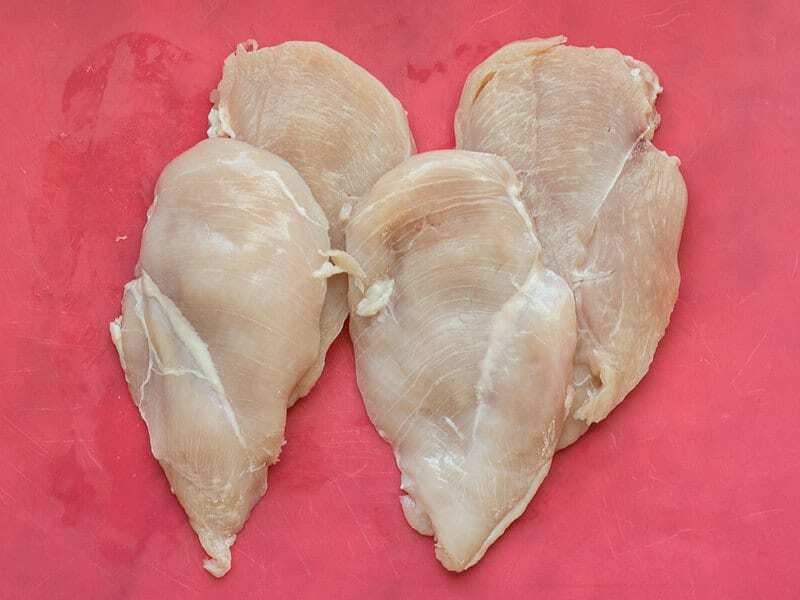 Filet each chicken breast into two thinner pieces. Place the pieces in the bag or dish, making sure the chicken pieces are completely covered in marinade. Marinate the chicken for 30 minutes up to 8 hours, turning occasionally to maximize the chicken's contact with the marinade. When ready to cook, heat a large skillet over medium flame. Transfer the chicken from the marinade to the hot skillet and cook on each side until well browned and cooked through (about 5-7 minutes each side, depending on the size of the pieces). I cooked two pieces at a time to avoid over crowding the skillet, which can cause juices to pool and prevents browning. Discard the excess marinade. 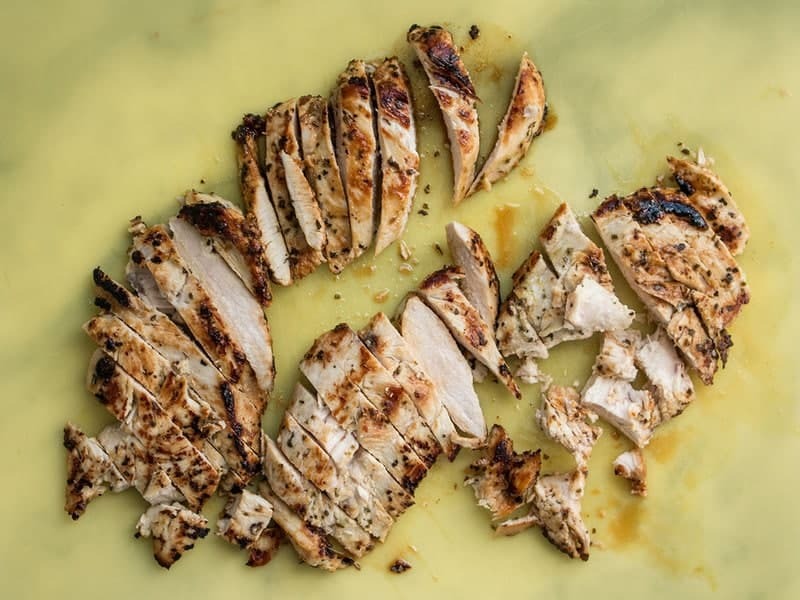 Transfer the cooked chicken from the skillet to a cutting board and let rest for five minutes before slicing and serving. *This marinade can also be used for chicken thighs. The amount of marinade listed in the recipe can handle about 4-6 chicken thighs, depending on their size. 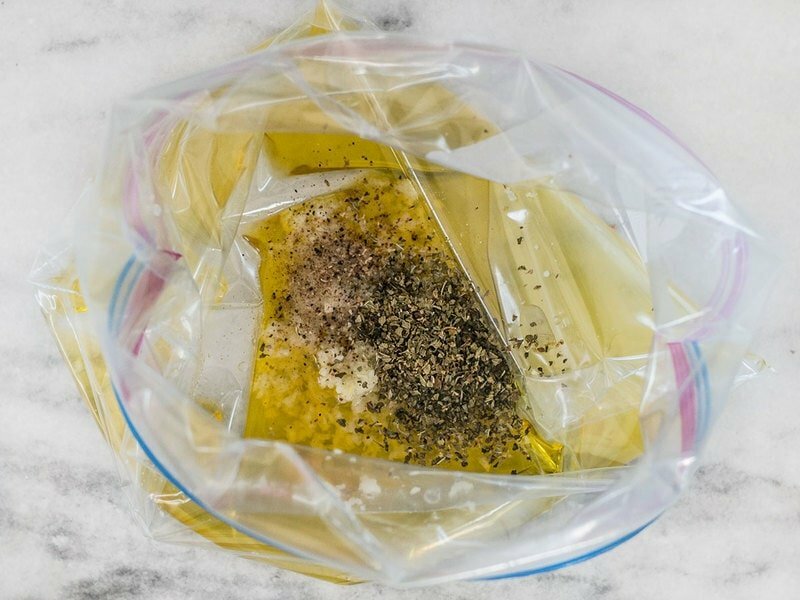 Add 1/4 cup olive oil, 1/4 cup lemon juice, 3 cloves of garlic (minced), 1/2 Tbsp dried oregano, 1/2 tsp salt, and some freshly cracked pepper to a large zip top bag or a large shallow dish. Stir or massage the bag to combine the ingredients. I used two large chicken breasts, which were about 1.5 lbs. total. Filet the breasts in half so that you have four thinner pieces. This helps maximize the marinade’s flavor and helps the chicken cook through faster in the skillet. Place the chicken breast pieces in the marinade and make sure the pieces are completely coated. 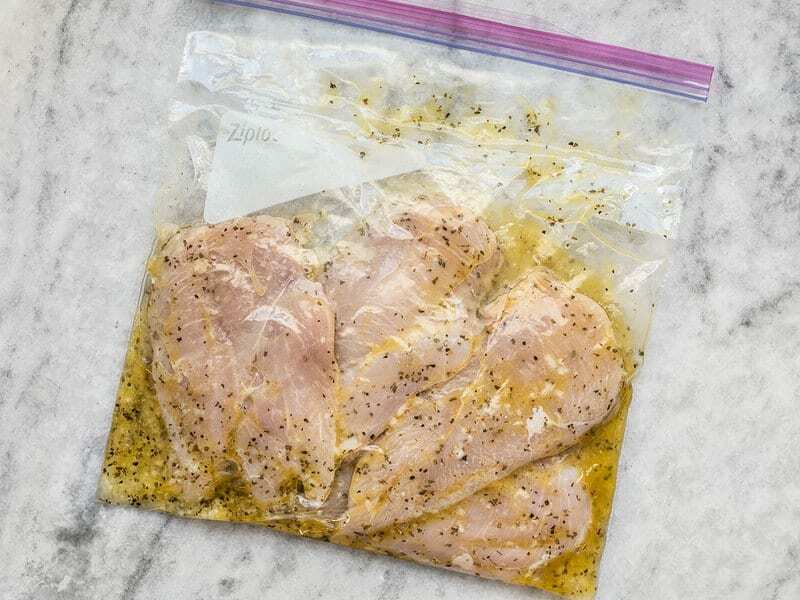 Marinate the chicken in the refrigerator for a minimum of 30 minutes or up to 8 hours. 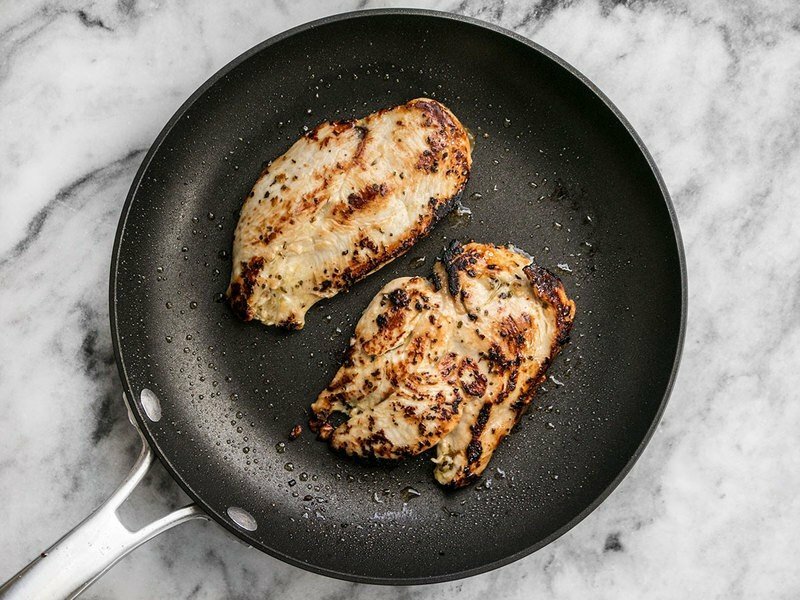 When you’re ready to cook the chicken, heat a skillet over medium. Once the skillet is hot, transfer the chicken from the marinade to the skillet and cook on each side until well browned and cooked through (about 5-7 minutes each side). I suggest cooking the chicken two pieces at a time to avoid over crowding the skillet, which can make the juices pool and prevent browning. Discard the extra marinade. Once cooked, transfer the chicken to a cutting board and let it sit for about five minutes before slicing. While the chicken was resting, I blistered the tomatoes. I just tossed one pint of cherry tomatoes into the skillet with the residual oil from the chicken and let them cook over medium, stirring only occasionally, until the skins blistered, burst, and the tomatoes became soft. The glass containers pictured in this post are from Amazon and can be found here. Awesome recipe. Made it for the next four days. How do you make the kale pasta shown in the picture? do the tomatoes stop tasting as good after they’ve been refrigerated? I know that’s a thing with raw, but unsure with these! Honestly I’ve never had an issue with tomatoes tasting bad after refrigerating, so if they did I probably didn’t notice… but I’m guessing that’s probably an issue with fresh rather than cooked tomatoes. This is very delicious. Tried it yesterday – didn’t have any garlic but had garlic powder so I threw that in instead. Tastes great!! Hi, i recently got the app and was fine with paying for it but was VERY disappointed how confusing it kind of is. 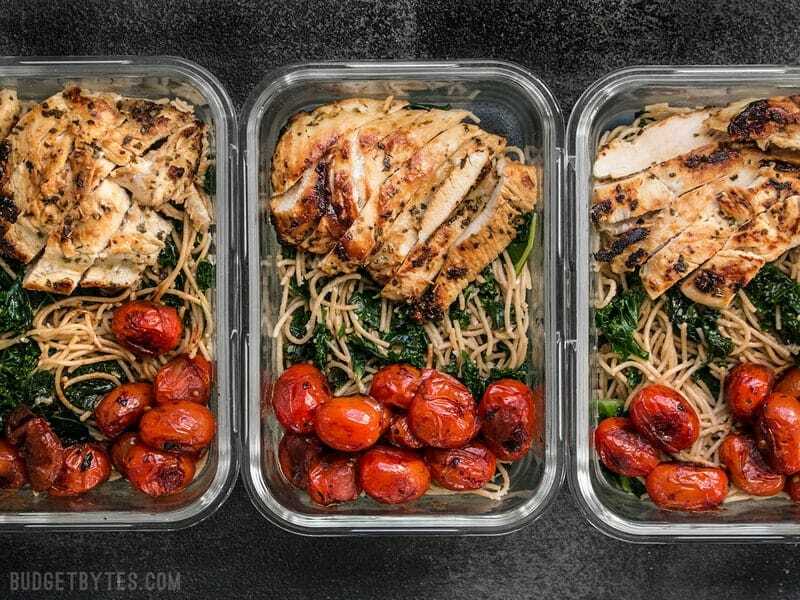 I always used this website to get meal prep ideas and loved it! That’s why I downloaded the app thinking it would be easier. I like how on the actual website you have a sections for the different genres, specifically for meal preps. That’s why I got disappointed that on the app you do not of a section with a list of meal preps. From at least I can see. If I’m wrong and there is a section on the app I would like to know where and how to get to it. Hi Mikaela, I’m sorry but we do not have the meal preps on the app yet. We are working on an update that will allow building grocery lists from multiple recipes and hopefully after that is built we’ll be able to add the meal preps. I can’t guarantee when that will be, so if you are unsatisfied with the rest of the app, you can always request a refund from the app store. This was a great recipe! I waited to add the garlic until a few minutes before the kale is fully cooked to avoid burning the garlic. For a faster meal, I subbed pre-cooked sausage for the chicken thighs, lightly browning them in the pan and then removing them and setting them aside before adding the kale. It came together super quickly. I made this with whole wheat spaghetti and loved it. Thank you! Hi! 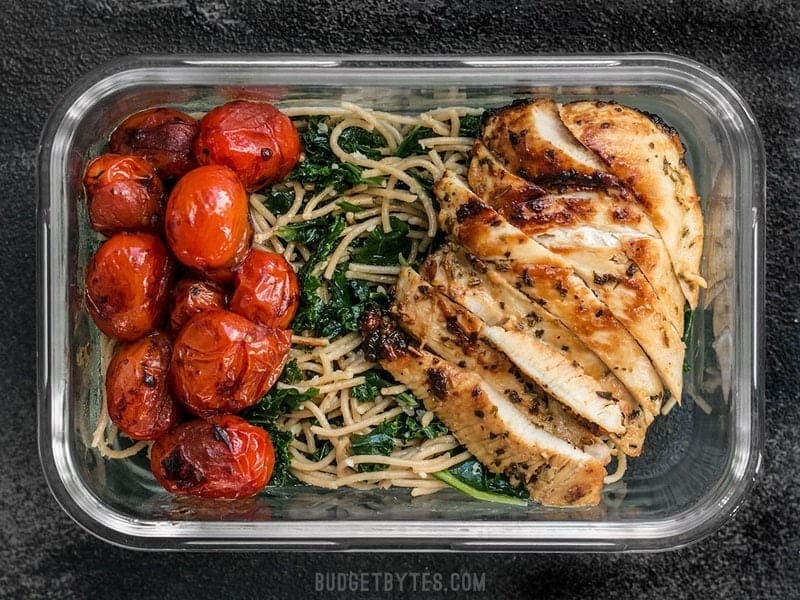 Can I freeze this meal and warm it up again days later on a microwave? Or would it make it be bad? I don’t think this one will freeze very well, although that’s largely subjective. If I was broke and needed to, I’d probably still freeze it, reheat it, and enjoy it. Haha!